Dad’s law enforcement career spanned more than forty years and was driven by his firm work ethic and stern determination. How this affected his later life and especially his retirement should have been totally predictable. Within a week of cleaning out his desk, he hit the streets, looking for work. He knew what he needed. He knew what he wanted. So, it was no surprise when he’d quickly become bored as the bailiff in the court of a local circuit judge. Too much down time, standing around waiting for something to happen, he’d explained. As a clerk in a hardware store, he’d found an organizational bonanza. As a bank currier he’d routinely made a loan officer’s day by getting those important bank documents from one branch to another in record time. Whatever it was, he had to be busy. He had to be useful. I knew I’d be able to spot him the minute I entered the nursing home. And sure enough, there he was taking care of business. The nurse’s station was the hub of all activity and it was also his command central, offering him a clear view of everybody and everything. He was constantly looking around, making note of details that might be meaningful at some unknown time in the future. I’d stopped just to let him know I’d made it to town. He always worried when he knew I was on the road alone. He gave me a quick “just a minute” gesture and then flagged down Mac, the social worker. As his oldest child, no one knew his need for order better than me. I’d fought him on every decision he made as a parent and disagreed with him on every issue, especially politics. I patiently waited my turn as he subtly got the attention of Marie, the nurse in charge. Marie and Dad nodded knowingly to each other as she hurried off. Dad and I then made our way to the aviary and settled in for a short chat before I headed to my parents’ house to help Mom with supper. As he did, whenever entering any room, he positioned himself where he had the best vantage point. I’d long ago accepted his habit of scanning the room and also knew he wasn’t missing any of the fine points of our conversation. After just a few minutes, Marie interrupted our visit. Dad’s bewilderment was heartbreaking to watch as she began to dispense his medication, then take her stethoscope off her shoulder and begin to search for his pulse. He surrendered to her requests with a sigh and a far off look. Dad went to the nursing home at age 87 and for over two years, he dealt courageously with this, his most difficult life transition. My sister, Karla, his durable power of attorney, visited nearly every day. She’d said that Mac had recently reported Dad’s many attempts to leave the building, setting off the alarm at all hours of the day and night. As his confusion increased, he’d begun telling elaborate stories of working all night, investigating crimes in Sheboygan and Manitowoc County. Since these were the actual places where he’d worked as a police officer, I assumed he was having vivid dreams about his past. Or, perhaps doing a life review. But then, Karla said he’d begun to believe the nursing home had hired him to take care of security. That’s really why he was there. He wasn’t a frail, elderly man who’d outlived his usefulness. No sir! He was a vital part of day-to-day operations. Suddenly, it all made sense, how I’d always find Dad sitting on the edges of the nurse’s station. Watching. Patrolling. He’d keep Mac informed of anything out of the ordinary. And Mac, bless his heart, always treated Dad with respect, telling him to go ahead with his investigations and thanking him for keeping the place safe. The caring attitude of all staff was apparent in how they didn’t inject the sad, hard truth into his fantasy. I’d never heard anyone say “no, Corky, you’re a retired policeman, not our security. Now let’s go down to the lounge for juice and cookies. “ I vividly recall how Manuel, the nursing assistant, had responded. As time passed and Dad’s reality shifted, he made a call to Mom who was living alone in their home across town. He had a serious question to ask, and he was worried. “Ma, I’m kind of tired. I think I’d like to quit this security thing.” The ever responsible breadwinner asked, “do you think we can afford it, if I quit?” Mom gave him an equally serious reply. “Yes, Corky. We can afford it. If you want to quit, why don’t you. You’ve worked hard for so many years and should take it easy now.” I thought her response was perfect and told her so. Dad and Karla had several serious conversations on the subject. When she was sure this is what Dad wanted, she helped him put on his good jacket and removed the worn out stocking cap he wore day and night. Then she brushed his hair and wheeled him down to Mac’s office. From there, Karla wheeled Dad down to the lounge for a snack and he began tackling his final job: becoming a nursing home resident. Several months after Dad died, Karla dropped off treats for the nursing home staff. When she saw Mac, it took only a second for them to lapse into reminiscing. Mac commented how much he missed Corky. When Karla recalled the day Dad had quit his security job, another memorable incident came to Mac’s mind. He chuckled, recalling the day the corporate office had sent a new representative to do one of their periodic inspections. As kids, Dad’s police work complicated our efforts to get away with anything. The boot camp that was our childhood home was bravely endured by all of us. We became accustomed to always being under surveillance. Meals at a certain time and don’t ever be late. A strict adherence to schedules. No compromise even when an unexpected fun opportunity arose. His certainty about right and wrong provided me with many parent/child conflict memories. But, it wasn’t until much, much later that I realized how his persistence had affected me. Parents are, after all, the most powerful role models. Dad taught by example to have opinions and not be afraid to defend them. What I thought of as bothersome in the past, I’ve now come to value. Surviving my strict childhood and adolescence, I am profoundly grateful for the strong work ethic and morally sound behavior he demonstrated. Even as he headed down that foggy, uncertain highway, he never seemed unsure of what he cared about and what was the right thing to do. From husband, father, policeman and nursing home security guard, he was true to his values right up to the end. Age is a matter of the mind. That’s a phrase I’ve used often that seemed to take on new meaning as I approached my seventieth birthday. I love it when I get comments that I don’t look as old as I am. Or better put, that I look younger than I am. But being seventy snuck up on me and I’m not sure what to do with it. As this milestone birthday approached, I was beside myself thinking about crossing over into the next decade. I’d no longer be able to say I was in my sixties. And that felt old! Maybe age is no longer a matter of the mind but a matter of facing reality. In a conversation with my friend, Betty, who will pass this same landmark later in the year, she reminded me to “think of all those who haven’t made it this far.” We’ve had friends our age and younger who’ve left us before their time and that’s a sobering thought. Betty reminded me that we’re lucky to be seventy. 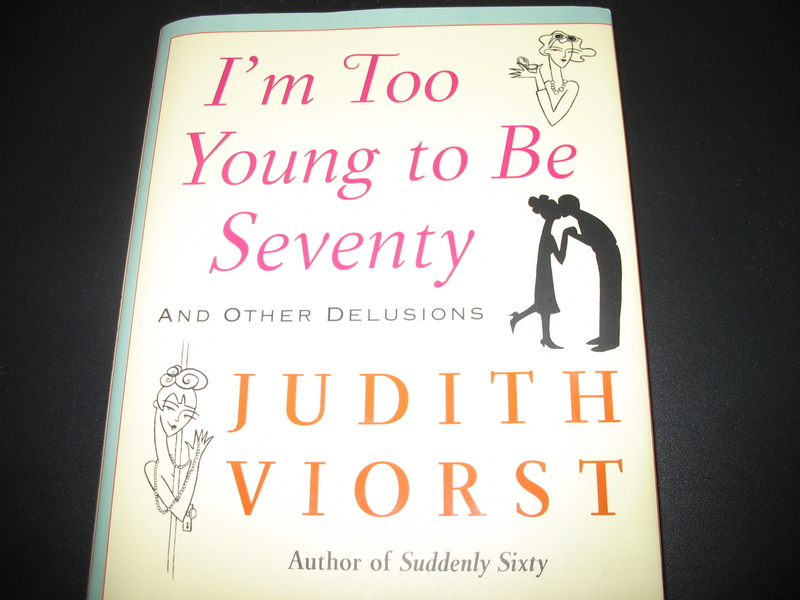 I happened upon a book by Judith Viorst that made me laugh. The title, I’m Too Young to Be Seventy, mirrored my thoughts and feelings perfectly. Then on the news I heard a declaration that 60 is the new 40. I guess that means that 70 is the new 50. I feel better already. People are living longer, said the reporter, and we’re a healthier society, more active now. There are articles everywhere about how, after retiring, John or Mary changed their life by pursuing a new career, striking out in a direction they’d always wanted to try. But that’s not me. I’m not looking for a new career and am pretty content to have my work years behind me. There are also many advice articles about planning the next phase of your life. Whatever that might be. Retirement is a challenge and I’m still working on that. I have days when I feel useless and lazy but it was shocking when I realized how often I was saying “I waste so much time.” Don’t get me wrong. I’m not saying I’m idle because I’m always doing something. Reading a book, writing an essay, watching TV, lunch and other activities either with friends or alone. But all these things seem to lack meaning or purpose. Some days I even feel guilty. Especially when watching TV news, it’s easy to see that the world is in upheaval and how unhappy so many people are. How come my life is so serene? Do I deserve this? Everyone says you’ve worked hard for many years; you’ve earned this time; enjoy it. I guess my challenge is to find a satisfying way to use all this leisure time. I’ve been taking stock lately. When I first retired, I purposely decided to take it slow and not jump into any responsibilities or commitments. That would have been just my style: stay busy so you don’t have to think. Now, after two years, I’ve reached a plateau where I’m comfortable with my life, am okay being alone and able to occupy myself. I’ve reconnected with many friends and have developed a pretty satisfying life. Maybe I’m finally ready to take on a volunteer opportunity, assume just a bit of a schedule, be needed or depended on just a little. There’s a hospice two blocks from where I live. Think I’ll give them a call. An elementary school has a reading program where their students come to my building and read with our residents. Next school year I think I’ll give that a try. I feel younger already. Mother, scholar, daughter, wife, who thrives on her superbly full life. My most precious confidante and good friend, helping me through to the bitter end. Advice, wise counsel forever abound, never leaving me feeling like a low down hound. Gems of insight and solutions found; laughter, giggles and guffaws by the pound. The one I turn to in worry or need; who never challenges my obvious greed. A purveyor of wisdom, trinkets of perception; and from me, always a welcome reception. That one prized person who always talks; whether sitting at coffee or out for a walk. Can I praise her enough for favors and aid; we get back to the point whenever waylaid. How this happens one has to wonder, could it be simply a mystical blunder? When intuition feels this right, it seems darned futile to put up a fight. Maybe coincidence or maybe just folly, that we met on this fortuitous trip, by golly! Whether cosmic accident or fateful design, whatever, the result is just fine. The peerless lesson being taught, is the one that, for any price can’t be bought. We embrace value showing up out of the blue, and firmly believe we’re getting our due. Not oldest in years, though I may be that too. But oldest in how long I’ve known her. We met in 1964, in college. Living in the House of SAW. One way Betty and I are alike, we hang onto people. I still hang out with my best friend from high school: Cathy. We’ve known each other for fifty years. Lost then reconnected since 1989. She and her school teacher friends welcomed me warmly. Our rental on the main street of Fish Creek. And Betty’s our inspired manager. Monthly girl’s night out at Mc Ginn’s. For baseball fans and naught. First timers must group-pantomime the Twelve Days. Birthday parties, retirement parties, luncheons and garden walks. No end to our “frivolity” (a favorite word). Single people with no children. Or with grown children, scattered. It’s an easy jump to who brings what and a date. Caroling “We Wish You A Merry Christmas” to neighbors. Our mother was a tough old gal. That’s after growing up as a tough young gal. We all know she came from a not so happy beginning to tenaciously build a life that was full and rich. Dad would say she was stubborn; I say she knew what was important to her. From the busy, card-playing family of her childhood, she became a wife, mother, grandmother and great grandmother. Mom was a self-taught, expert seamstress; I have early memories of her current project always draped over the sewing machine in the dining room. She even made suits for Dad that no one ever guessed were homemade. One Christmas, all my presents were outfits sewn by Mom, a new one to wear to school each day for two whole weeks! My friends insisted they were too stylish to have been made at home. One even accused me of sneaking off to Milwaukee to shop. Mom loved that story. She also loved to gift her kids, husband and grandchildren with a new hand-knit sweater complete with a personalized “Made by Bea” tag. Where did she find the time along with the cooking, cleaning and taking care of six kids? Mom was the queen of cookies, mixing up a batch whenever the whim hit her. And that was often. The plastic containers on her pantry shelves were the first place grandchildren (everyone, actually) headed when coming for a visit. Even before a hello kiss. And getting a container to take home wasn’t a treat, but a common practice. Mom especially loved being “Granny.” She was a special friend, a purveyor of inside jokes and a confidant during troubled times for all her grandchildren. An active member of her community, Mom was involved with her parish, Blessed Sacrament. And the way they took care of her, rides to Mass and a visitor for communion and confession, allowed her to remain active with her faith which was so important to her. She especially loved going to the Senior meals. And she took her duties as pen pal to the students very seriously, responding with personalized comments to each of their letters. Mom loved her home and neighborhood; in later years, she was a sight to see, tooling up and down the block with her walker. These very special neighbors watched out for her, checked on her often, one brought her homemade bread, invited her to neighborhood events and probably contributed to her being able to remain in her beloved home as long as she was able. Dad always joked that his and Mom’s marriage resembled the cartoon, The Lockhorn’s and the radio program, The Bickersons. With Mom’s passing on Corky’s birthday, April 7, it’s for sure that the thunder and lightning that night signaled the end of the honeymoon as they wrapped up their birthday/reunion party. For Bea Bickerson and Corky Lockhorn, some things will never change. Though we will miss Mom greatly, she’s finally at peace and our memories will remain vivid. I like to think she’s somewhere playing cards and laughing at jokes told in German by her mother, Mary and Aunt Gert. Along with kibitzing from Corky, of course. Friends of any age can be held dear. Sharing secrets and joys simply adds to the song. Connection through the decades holds on strong. Old as a mother, righting the wrong. The first thing I did when thinking about blogging was watch, once again, the movie, Julie and Julia. It’s the true story of how writer, Julie Powell, blogged about cooking her way through Julia Child’s Mastering the Art of French Cooking. The result was a book deal (2005), a movie deal (2009) and being launched as a writer. My goals were less grand but her experiences helped me in some surprising ways to find my own path to blogging. After watching the movie, I perused some of the hundreds, perhaps thousands, of blogs already out there; almost any interest known to man is the topic of a blog. Some impressed me with their clear message or purpose. The chaotic, cluttered and unorganized ones showed me what I didn’t want to do. From that, I could see how important it was to make a good first impression. I also understood I had the flexibility to do pretty much whatever I wanted. Then, I thought long and hard about my goals. In the movie, Julie let the whole experience unravel her life. She worried about who was or wasn’t reading her; she obsessed over whether or not she was disappointing her readers. She had self-described “meltdowns” that wreaked havoc on her life, her work and her marriage. This insanity was something I knew I wanted no part of. I was sure of one thing. If I was going to do this it had to be for me. I wanted my work out there and thought this might give me a sense of accomplishment. And if I were read that would be like icing on the cake. And if I received comments, that would be like sprinkles. Writing friends reminded me that once a piece was on the blog it would be considered “published.” I decided I could live with that. Lastly, I found help. I probably could have done this myself but knowing my learning style, I needed a guide. I asked around and found just the person, someone with computer skills and her own blog. We met once a month and she helped me get started. In between sessions, I was alone as I began to post my writing and become more comfortable with the program. Any barriers encountered or questions were put on my list for our next session. It was money well spent. There are several different programs for designing and maintaining a blog with comparable options for layout and easy navigation. The programs keep statistics to check such things as number of visitors and number of reads and an on-line support network for questions. I’ve been blogging now for six months and have over fifty pieces posted in seven categories. Family memoirs, my adjustment to retirement; friendships. No subject is too small. For any piece that was previously published, I’ve included the date and place of publication at the beginning of the post. This process has me writing every day and always working on something because I now have a place to put it. Being newly retired from a world full of deadlines, my blog fills a gap by giving me a project. And it’s the best solution since I’m setting my own deadlines now. I’m still submitting in the traditional way and currently have two essays I’ve submitted to magazines. Once they’re either published or rejected, I can post them on my blog. My blog (a million little memoirs.wordpress) has taken on a life of its own. I’m energized and motivated to write all the stories I’ve carried around in my head for so many years. These good feelings made me curious about Julie Powell and her follow-up story has an interesting wrinkle and perhaps a lesson for all writers. How heartbreaking for this writer. While Julie Powell is now famous enough to be on Wikipedia, perhaps she’s more importantly an example of why it’s imperative to know yourself and your goals before blogging. And to remember that once it’s on the blog, it’s out there forever, for all to see.